In Denmark many churches are almost empty. While the clergy publicly discuss the existence of God, television programmes on spirit manifestations recently attracted high numbers of viewers. These programmes present a “hands-on” relationship to the supernatural in which ordinary people relate their experiences of spirits. The fascination with the spirit world has always existed side by side with established religion and has been frowned upon if not seen as heresy by the church. Earlier it would have been questionable to show interest in the impact of ancestor spirits, but within the last few years it has become commonplace through popular TV programmes and newspapers. The main aim of shamanistic initiation among the Yanomami people of the Upper Orinoco River region in Venezuela is the metamorphosis of the human body into a Cosmic Body, the “corporeal cosmo-genesis.” During the initiation, the neophyte undergoes an experience of death and rebirth, becomes simultaneously an individual living spirit and a “collection” of spirits who move into his body and become his personal allies and sources of power while at the same time imbuing the shaman’s post mortem ego with certain holographic properties. The fusion of body and cosmos is manifested on two levels (1) The micro-cosmic level whereby the shaman’s body becomes a micro-replica of the Yanomami universe, and (2) The macro-cosmic level whereby the candidate’s ego-consciousness expands and becomes unified with the external dimensionality of the macrocosm. 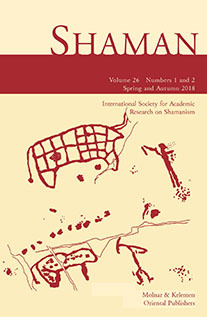 This paper discusses ways in which the interaction of participants with the ritual activity in a variety of Chinese shamanist seasonal rites can generate diverse meanings and thus contribute to the rite’s vitality as a living experience for the community. Any rite has a core of common meaning; but its wonder, symbolism, and mimetic activity give it an open-ended, “virtual” aspect that allows each participant to realize its meaning differently in accord with his or her own experience and expectancies. The discussion focuses on Qiang, Naxi, Yi, Han, and Manchu rites. For its analytical framework, it borrows concepts from literary criticism, especially “audience response” criticism. The mythical relationship between man and bear found in the vocabulary and folklore of Finnish related peoples gives basis to call these cultures “Peoples of the Big Bear” rather than “Peoples of the Water Bird” (Estonian President Lennart Meri’s book and film). Only few pictures of bears are to be found in the North Eurasian and Siberian rock art. Since the bear, however, has been common, His absence in the rock art must be based on ideological reasons. The attitudes to the bear have been ambivalent. People have been afraid of Him but at the same time the human animal has been highly admired. This state of affairs is reflected in the bear ritual. The central purpose is to appease the divine predator and to return the soul of the bear to His celestial home. The Saami consider the bear as a man in camouflage, a transformed cultural hero. Modern brain research shapes the scientific understanding of human mind and consciousness, and initially challenges the anthropological record related to studies on shamanism. Further analysis, however, clearly reveals that the same anthropological record challenges the computational model of cognitive science. Shamanic states of ecstasy and trance add significant data to the complexity of human intelligence since such states cannot be delegated to categories of abnormal psychology, as pioneering work by Ake Hultkrantz and other scholars in shamanism demonstrates. The shaman’s skill in claiming authorship during ecstasy exceeds functionalist interpretations of brain activity, providing valid data for understanding mental fields and their role in physical causation. Origins of the religious impulse and its biological nature are illustrated in the cross-cultural distribution of shamanism and its universal features. The biological bases of shamanism are illustrated by the relationship of shamanic universals to brain processes, reflecting shamanic elicitation of neurognostic structures, innate brain modules, and fundamental structures of consciousness. Shamans’ experiences (e.g., soul flight, guardian spirit quest, death and rebirth) involve fundamental structures of social cognition and representations of psyche, self and other. Shamanism involves social adaptations that utilize biological potentials provided by integrative altered states of consciousness (ASC) to facilitate community integration, personal development and healing.